We’ve already seen circular shaped Android Wear smartwatches from Motorola and LG, but earlier today at Mobile World Congress in Barcelona, Spain, Chinese company Huawei officially unveiled its own take on the round-faced smartwatch – the simply named Huawei Watch. Featuring a cold-forged stainless steel frame, the Huawei Watch is a premium-looking smartwatch with a design that is likely to appeal to those who prefer their wearables to look more like traditional timepieces. It has a completely circular 1.4-inch AMOLED display with a resolution of 400×400 pixels (286 ppi), which is protected by a scratch-proof sapphire crystal lens. Underneath the screen, the Huawei Watch boasts a 1.2GHz Qualcomm processor with 512MB of RAM, and 4GB of storage. It also features a built-in heart rate monitor, a six-axis motion sensor, and a barometer. Huawei says the motion sensor can automatically detect and track different kinds of activity – including walking, running and cycling. 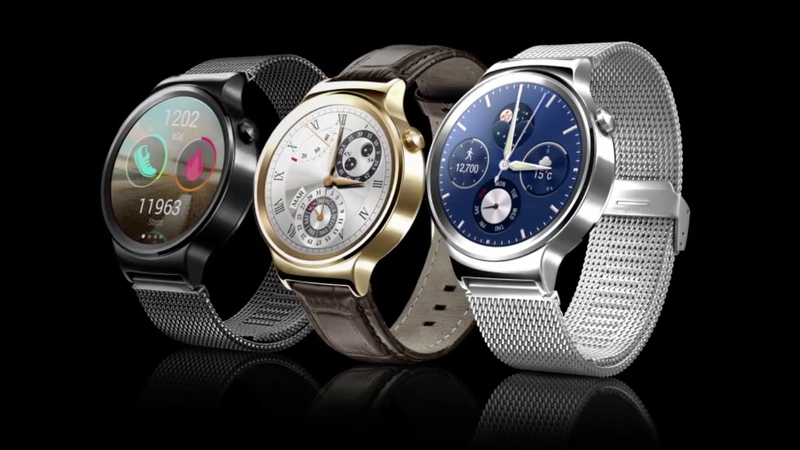 The Huawei Watch will be available in three different designs: gold, silver, and black. Huawei will be offering over forty unique watch faces and a range of different watch straps to complement the device. Pricing and availability for the watch will be announced at a later date. All in all, the Huawei Watch looks to be a very solid Android Wear device – especially when you consider that this is Huawei’s first entry into the smartwatch market. I’ll definitely be following its progress closely. We’d love to hear what you think about the Huawei Watch. You can let us know your thoughts by leaving a comment below or by tagging us on social. Fantastic!. I’ll buy one when they go on the market. Thank you Paul, for this nice video. They are pretty and look useful, hey seem a bit bigger than I’m used to. I like watches about 35mm vs the 42mm of the Huawei and it appeared to be a big deeper than the 9mm depth of my watch. But I guess if you wear a Rolex, then their size would seem normal. Otherwise, I’d love to have one if the price was right. Thanks for the info Paul, sounds like it’s going to compete with the lot of them for my money, though it would be great if it had NFC as well. That is the one feature that is lacking in most of the android wear devices, it would make Google Wallet much more convenient to use, I feel that in this area Apple is one step ahead everyone else with the Apple Watch and Apple Pay.